38W x 19D x 49H "Northampton"
25W x 16D x 57H "Akron"
24W x 16D x 30H "Annapolis"
in the upper right drawer, one of eight drawers. "Westmont"
Note: All Cherry Bedroom Furniture shown in the Brandywine Finish. 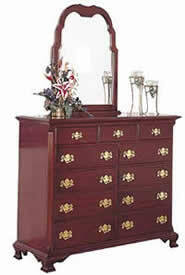 Brandywine is our red cherry bedroom furniture finish. Cambridge Finish is our brown cherry bedroom furniture option.